Decorative Life: Can last for many months and even years but this species is not as tolerant to commonly found interior conditions, can be susceptible to pests like spider mites and/or can be somewhat intolerant to growing media physical and chemical changes compared to many other foliage plant species. 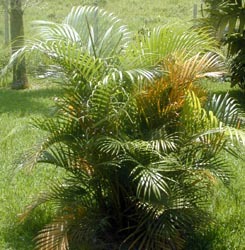 Nutrient disorders, especially iron and/or manganese imbalances, can result in yellow newer leaves. In addition, this species can be attacked by many diseases, the symptoms of which can sometimes be similar to nutrient imbalances. 40-60 degrees F for five or fewer days is okay but they would do better if always held at 55-65 degrees F.
The specific epithet name “lutescens” means yellow, in reference to the flower color. Chrysalidocarpus: Greek for golden fruit. Members of this family provide the world with many products including food (coconut and oil), ornamentals, wax, fibers and beverages. Will generally not grow well in light levels just bright enough to read a newspaper in comfort. Check for “insects” such as scale, mealybugs and spider mites. The word “insects” is in quotes because technically, spider mites are not insects. Reyes et al. (1996) grew plants for eight months using three light and three fertilization schedules and found that subsequent plant quality decreased nearly equally under interior holding conditions, regardless of the preharvest treatments. They concluded that this species requires high interior light levels. Poole and Conover (1993) stored this species at 36-46F from 1-4 days and subsequently noted yellowing of lower foliage but that the plants were still salable.